London - South African javelin thrower Sunette Viljoen has narrowly missed out on a medal after finishing fourth in the woman's javelin final at the London Olympic Games on Thursday night. 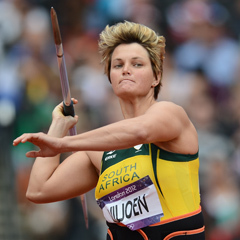 The 28-year-old Viljoen struggled on the night, with her best throw coming on her very first attempt when she reached 64.53m, which left her in fourth spot. Barbora Spotakova from the Czech Republic won gold in 69.55m, while Germany's Christina Obergfoll claimed silver in 65.16. Another German, Linda Stahl, pipped Viljoen for the bronze medal with a best throw of 64.91.